Perennial from a basal rosette with broad oval leaves. Often mistaken for the closely related broadleaf plantain (Plantago major). Found throughout the United States, primarily a weed of turfgrass. Cotyledons are spatula-shaped and joined at the base. Young leaves oval to elliptic with leaves that encircle the stem. Usually lacking hairs, oval to elliptic and tapered at the tip, with a somewhat waxy surface and veins that are parallel to the margins. Margins are usually wavy and toothed. Petiole bases are conspicuously red or purple tinged. Flowers produced on unbranched stalks (scapes) that arise from the rosette. Flowering stems are 5-15 inches long, clustered with small flowers that have whitish petals and bracts surrounding the flowers. 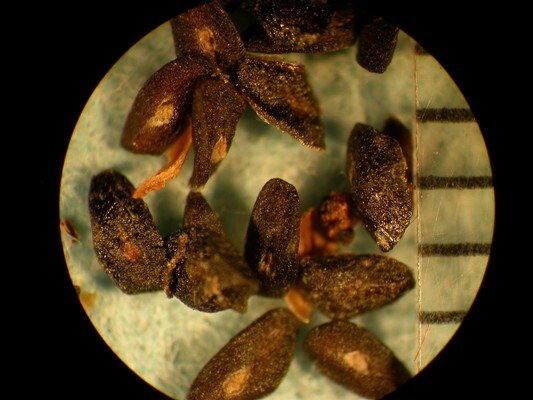 A cylindrical, 4-6 mm long, 4-10 seeded capsule that splits below the middle. 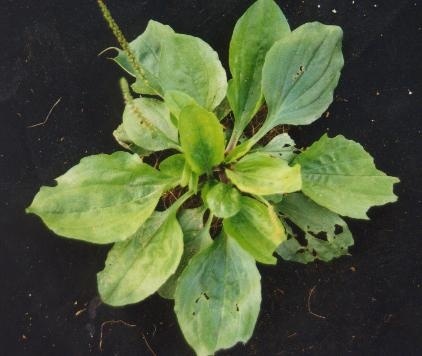 Blackseed Plantain (Plantago rugelii) has petioles with red or purple colorations at their bases, a lighter green, less waxy leaf appearance, and capsules that split below the middle. These are all characteristics that help to distinguish it from the closely-related Broadleaf Plantain (Plantago major). Additionally, the leaves of blackseed plantain are hairless, and have toothed and wavy margins, unlike the leaves of broadleaf plantain.